E-Learning Voice Over for K-12 projects. Commercials and promos for radio, television, internet and related media. Demo's, show-reels, documentaries, e-books and audio books. Corporate or industrial presentations, on line or web based training projects. Educational DVD's, CD's and videos. Narrations, Dubbing, live-action features and films. I also work on Projects Outsourced with short TAT and best Quality as I work close with best Studios. My team includes very good Voice Talent Professionals . 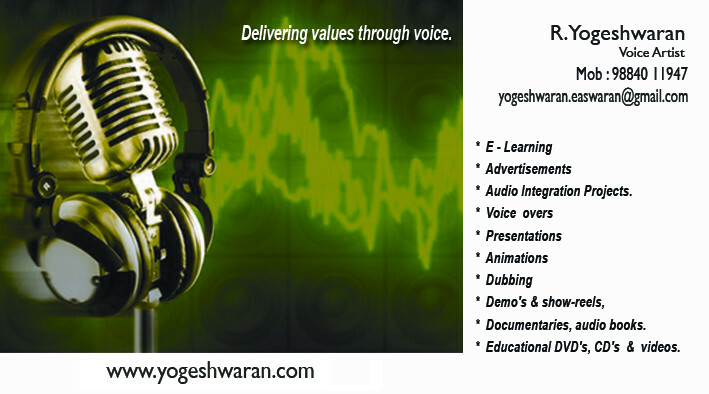 If you're looking for Voice Talent in the above areas , please contact me for additional information. If you are considering a career in voice-overs, I encourage you to join the Voice Over workshop - "Awaken the voice talent in you"